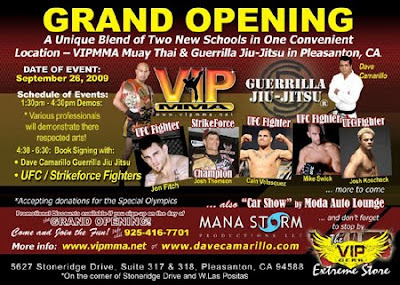 Fans can meet and get autographs and pictures this Saturday afternoon with UFC fighters Mike Swick, Josh Koscheck, Cain Velasquez, and Jon Fitch at the new VIP MMA and Guerrilla Jiu-Jitsu Headquarters in Pleasanton, California. Strikeforce lightweight champion, Josh "The Punk" Thomson, will also be there. There will also be MMA demonstrations, a car show, food, and music. The festivities begin at 1:30pm and end at 6:30pm. For more information, check out VIP MMA's website. This is a great opportunity for fans to meet some of the best fighters in the world. This is one of the better fan altercation/fights I have seen lately. This happened at the Lions vs. Vikings game last week. 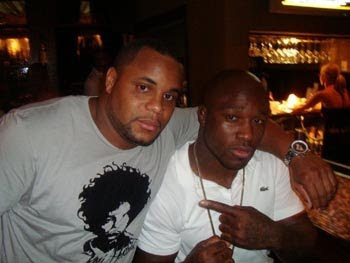 Daniel Cormier is a former outstanding Oklahoma State wrestler and US Olympian who will be making his MMA debut this Friday on the Strikeforce Challengers show against Gary Frazier in the heavyweight division. Cormier's fight is expected to be the first fight of the night and it will be live on the cable network, Showtime. He is currently training in San Jose, California at the American Kickboxing Academy (AKA) to prepare for his fight. How's it going DC? Are you ready and excited about your upcoming fight against Gary Frazier on Friday? Yes, I am really excited about the fight. I've had a good training camp and I feel well prepared. What do you know about Frazier? You know, I don't know much about Gary. I know that he also is a wrestler and a great athlete. Any man that steps into the cage has my respect. What can fans watching on Showtime this Friday night expect to see from you? What they can expect is a guy that goes forward, and sets the pace of his fights. Fans will never feel cheated with me because I will always give 110 percent either in victory or defeat. Hopefully I can excite them, and make them never want to miss a DC fight. What has been the biggest transition for you going from wrestling to MMA? The biggest transition has been the striking. I'm sure that's what all wrestlers say. Learning to punch correctly is a tough thing to do (laughs). There are a lot of MMA gyms all over the country. Why did you pick AKA as the place to train? I chose AKA because it's one of the best camps in the fight game and my training situation is unmatched. To be able to go and train with the guys I train with daily is a blessing. It was just the best place for me. I knew that after being here for two days. Of all the great and talented fighters in AKA that you train with on a daily basis, which one has impressed you the most? All of the guys train really hard, but I must say no one has impressed me more than Cain Velasquez. He's one of the biggest guys in the gym, but also one of the hardest workers. Those two things don't normally go together. He has unbelievable skill too. Can you tell me what a regular day of training at AKA consists of? The training varies from day to day. Monday, Wednesday, and Friday are sparring days and Tuesdays and Thursdays are grappling and jiu jitsu days. At night, we do individual workouts and cardio. How do you enjoy living in the Bay Area? What is the biggest difference between living here and the other places you have lived at? Living here has been cool. I've been in Stillwater for 10 years and it's real small. The diversity of this city (San Jose) has been the biggest change. Also, if you have time, there are always things to do here. such as concerts and shows. Were you a MMA fan growing up and do you have any fighters that you look up to? I have watched MMA since the early days. For me though, most everything goes back to wrestling so watching Kevin Jackson and Kenny Monday fight was always cool to me. Thanks a lot DC for taking the time to talk to me. Good luck in your MMA debut. Thanks for having me and watch the fights on September 25th. I also want to thank Gary Frazier for accepting the fight on such short notice. Lastly, I want to thank all my sponsors and say what's up to my team Thirsty and GDP brother KING MO. DC. GDP!!!! UFC Fight Night 19 is tonight on Spike TV. It will begin at 8pm PT and it is a taped broadcast on the West Coast. There are 11 fights on the card but only four scheduled fights on Spike TV. Spike TV is channel 45 in San Francisco if you have Comcast Cable. The main event will be between Melvin Guillard against Nate Diaz in a battle of lightweights. If these fights finish early, the viewers will be able to watch some of the seven prelim fights. I have no idea why the UFC and Spike TV decided to have the Quarry/Credeur fight on the main card instead of some of the prelim fights such as Sam Stout vs. Philllipe Nover or CB Dolloway vs. Jay Silva. I think those two fights could be very exciting and hopefully we get to see at least one of those two on television tonight. Brian Stann vs. Steve Cantwell is another good fight that is not scheduled to air tonight. Another match that I am looking foward to is Jeremy Stephens vs. Justin Buchholtz but that fight is also on the prelim card. Cantwell has a video of him training for Stann here. Huerta told the UFC that he plans to quit MMA and that he wants to focus on a movie and acting career after his fight with Maynard. You can check a video of Huerta training for the fight here. Maynard is not a very exciting fighter and all he does is lay and pray. He gets his opponents down on the mat and he doesn't do much after that. Let's hope that this fight will be exciting but this fight could turn out like most of Maynard's fights and be very dull. No one expects Guillard to beat Diaz but Guillard has power in his hands and has a puncher's chance in beating Diaz. Diaz is way superior on the ground and he will most likely submit Guillard if the fight gets to the ground. Stay tuned after the fights on Spike TV for The Ultimate Fighter 10. Kimbo Slice is one of the 16 competitors on the show and this season might be one of the best seasons yet. USC Football Players Sing "Lean On Me"